Shen Yun Performing Arts, is a performing arts and entertainment company based in New York City. 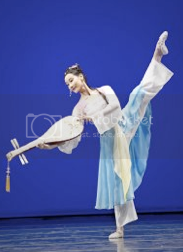 It performs classical Chinese dance, ethnic and folk dance, and story-based dance. Founded in 2006, the Shen Yun troupe is often associated with the Falun Gong spiritual practice, and performances around the world are hosted by local Falun Dafa Associations. Kelly Wen, Master of Ceremonies for Shen Yun, stated that the underlying ideas of the performance is to “revive the essence of 5000 years of culture”, which Wen described as a lost art destroyed by the Chinese communist government. Among others, the show has been praised by Broadway critic Richard Connema, who gave it five stars, while other reviews, such as The Guardian, criticised the show for promoting Falun Gong without saying so explicitly enough. According to a press release in The New York Times, Shen Yun has more than 200 members and perform seven months a year. The show’s acts and production staff are trained at Shen Yun’s headquarters in Cuddebackville, in Orange County, New York. Shen Yun enacts three distinct forms of Chinese dance in its performances: classical Chinese dance, ethnic and folk dance (for instance, dances of China’s Dai and Mongolian ethnic minorities), and story-based dance, presenting classic Chinese stories such as the legend of Mulan.